Teeth are held in our jaw by a specialized type of bone referred to as “alveolar bone”. When tooth loss occurs, we begin to lose that bone (otherwise called “bone resorption”). At the beginning, it resorbs quickly with up to 60% of the total volume gone within 3 years. Without intervention, this will continue throughout a person’s lifetime and only get worse. This is problematic for a few reasons. Reason 1: Aesthetics. If you’ve ever seen someone who is missing teeth or someone who isn’t wearing a denture they normally use, you’ve probably noticed that their face appears collapsed. That is because they’ve lost teeth and alveolar bone! The teeth and bone support the appearance of our face. Reason 2: Function. That bone normally provides a very important function for chewing and load bearing. Bone grafting is mostly done in conjunction with implant treatment to replace missing bone and teeth. Bone augmentation (or, grafting) procedures are designed to re-establish the bone volume to improve aesthetics and restore function. There is a very well documented pattern of how the bone resorbs after a tooth is lost and it depends on where in the mouth the tooth was removed from. In general, bone loss occurs primarily in width at first. As the bone loss continues, it is lost in height as well. The latter pattern is much harder to regain and often in not possible. It is important therefore to try and intercept the pattern of bone loss before it collapses in height. In the front of the mouth, where aesthetics are more crucial, alveolar bone tends to be lost rather quickly. As a result it is common to graft bone immediately following tooth removal. 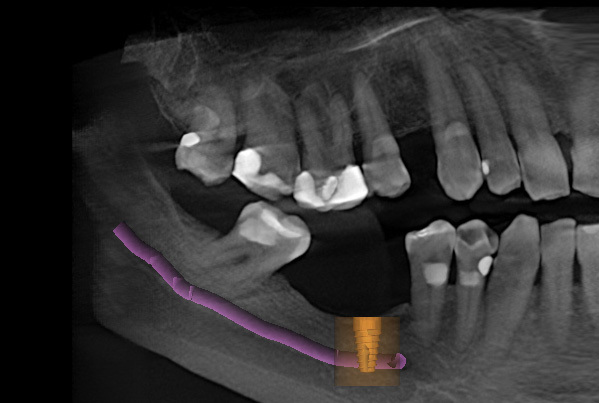 This can be done as a stand alone procedure known as a ridge preservation or in conjunction with implant placement. In the back of the mouth there are important anatomical structures that can become problematic. In the lower jaw there is a nerve running below the teeth. As teeth are lost and the bone collapses, the nerve becomes closer to the surface of the jaw. 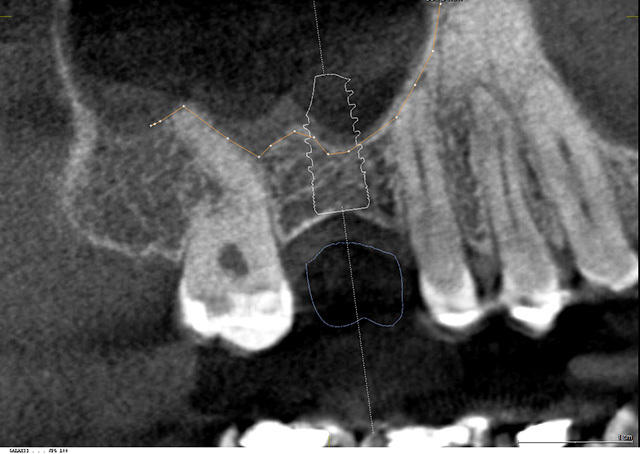 Over time, this makes implant placement more difficult as there is less space available above the nerve position. Below is an example of a case where there is enough room to place an implant well above the nerve. This tooth was removed and grafted immediately to avoid any bone loss. 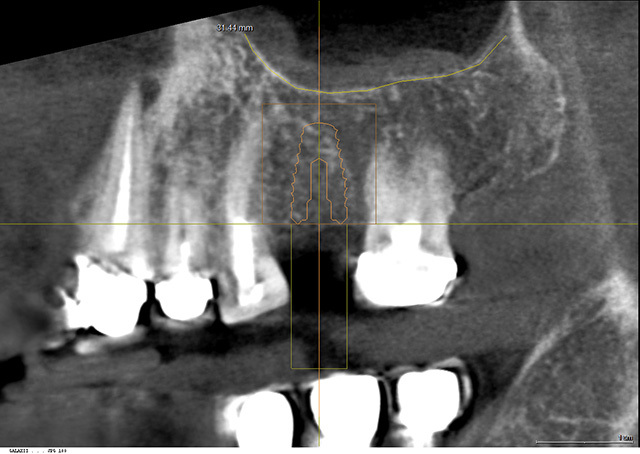 Below is a case where tooth loss went on without intervention for years. Now there is no room to place even the smallest of implants. In fact, you can see how the virtual implant and the nerve would intersect. Therefore this person is not a good candidate for implants. In the upper jaw, once the back teeth are removed, the maxillary sinus expands into the jaw bone. That means that after tooth loss the bone will be replaced by air (the sinus is just a cavity filled with air). This is known as “sinus pneumatisation”. As a result, placing implants in the back of the upper jaw will usually involve some kind of sinus grafting know as a “sinus lift”. 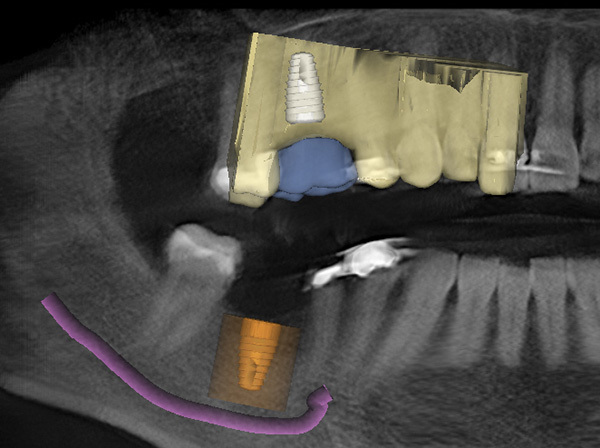 Here is an example where there is adequate space to place an implant below the sinus. Bone Grafting will help to place larger diameter implants in ideal locations that are stable and serviceable for a long time. It also helps to establish normal volume and dimensions of bone for ideal aesthetics, lip support and phonetics. Bone grafting is a well-accepted and safe procedure.